BAE Systems Exhibit by Idea International, Inc.
BAE Systems is a global defense, aerospace and security company with wide-ranging products and services that cover air, land and naval forces, as well as advanced electronics, security, information technology, and support services. 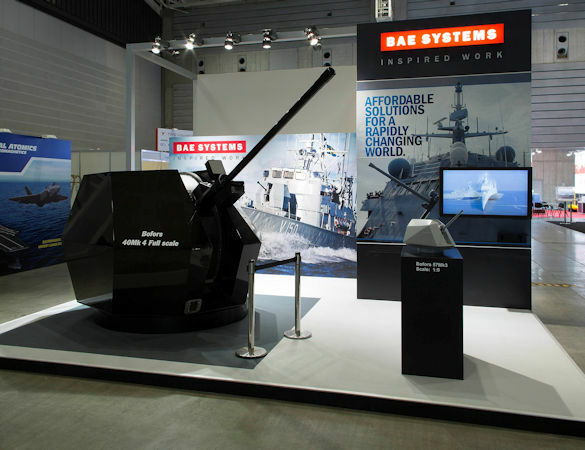 At Maritime/Air Systems & Technologies (MAST) where the focus is primarily on naval (undersea, surface, air, and cyber) platforms, systems, and technologies, BAE was able to connect with senior level attendees from over 40 countries and showcase the Bofors 40 Mk4, its state of the art naval gun, in this 6m x 6m space. The stark product display—both full size and a smaller model–communicated the appropriate gravity of situations demanding the Bofors to the military decision makers in attendance at MAST.